We arrive at Casablanca in the morning, at rush hour. We engulf ourselves in the city’s endless traffic jams; a cosmopolitan atmosphere emerges from its streets, and its Art Deco-inspired buildings contrast with the chaotic architecture of the old town’s narrow streets. 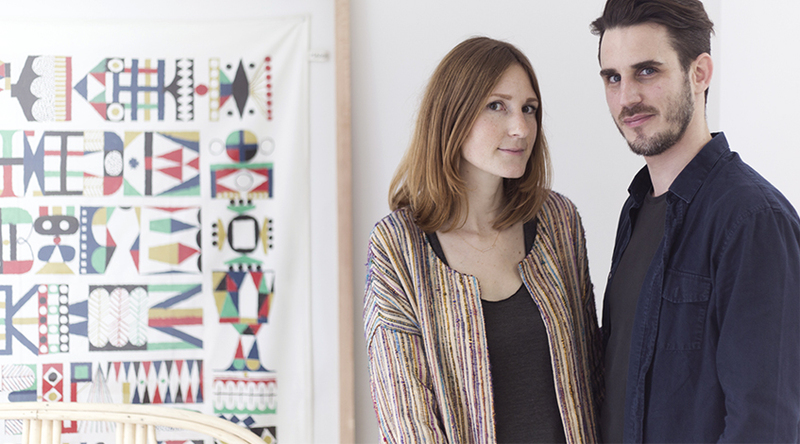 In the city centre Is located Craie’s workshop, a French brand that offers leather goods and shoes, created by Sébastien Germès and Camille Levai, two young and talented artists, passionate about art and travel who started this fascinating journey six years ago. Their complicity, their know-how and their experience in this sector have turned Craie into a unique and highly desirable brand. Everywhere in the world, Craie has become a must-have for those who love French fashion and believe in the power of a beautiful handbag or pair of shoes to complete the perfect outfit. Sebastien and Camille told us all about their manufacturing process and showed us how each detail is fashioned in their workshop. can you please explain how the craie brand was created? Craie was born in 2012 from our desire to create shoes and handbags that were different from what we could find on the market. 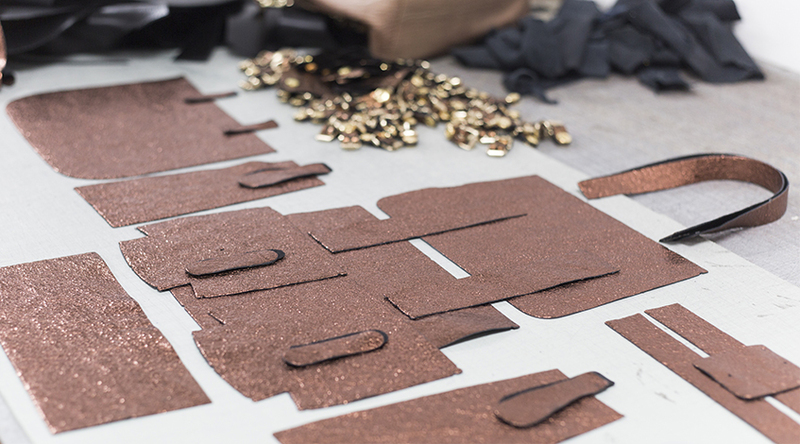 The starting point was our love for both leather and creation. At the beginning we were mainly using goat leather for its flexibility and durability: it has a natural grain that is very interesting and on the other side you’ll find the softest velvet material. We are really curious about how a modern woman spends her days: in the morning she takes her bag to go to the office, then she goes for a drink, for dinner, she dances and she comes back on a bike. We were thinking about a handbag that could be reversible, that could change colour and be flexible, a bag that could be a handbag but also a backpack. 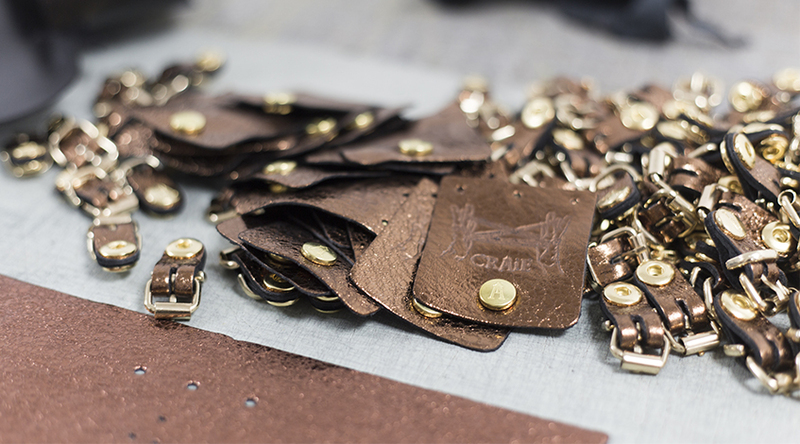 Everything got real in 2012 when we opened a workshop in Morocco, the cradle of leather goods and craftsmanship. This “laboratory” allows us to experiment all of our ideas until we have our collections. You work as a duo, how do you split the tasks? 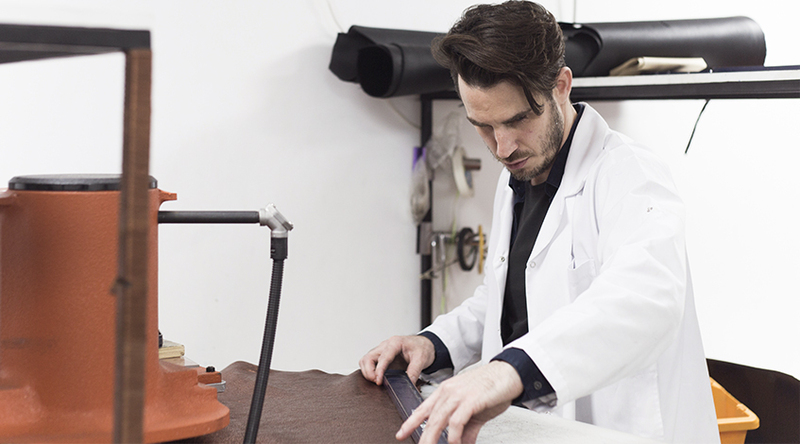 Sébastien takes care of everything that happens before the product is created, he hunts for raw materials, experiments, creates unique leathers, looks for unique know-hows and for partnerships to create high quality products. We create the collections together. I’m in charge of choosing colours, building mood boards…in a way, I’m in charge of defining the atmosphere of the season. I also prepare the catalogues, the product pictures and our collection’s photoshoot, I do everything related to communications. what's the philosophy of your brand? Could you describe your creative process? What happens when you create a new collection? 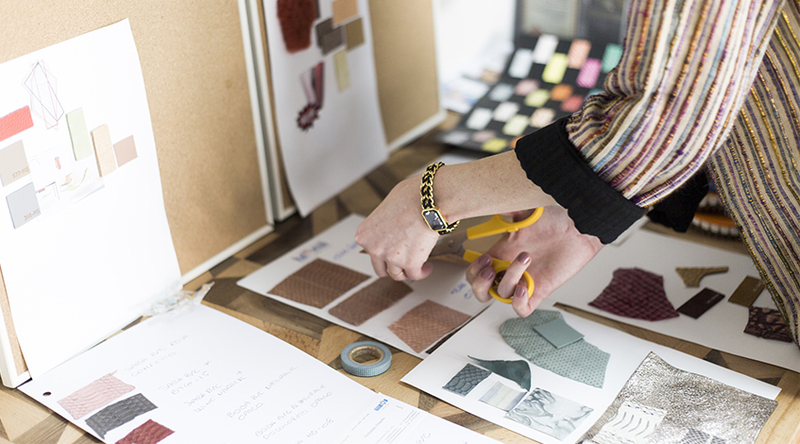 Everything starts with colours, materials, leather. Sébastien spends hours in tanneries in France, Italy and in Morocco in order to develop exclusive leathers for our collections. 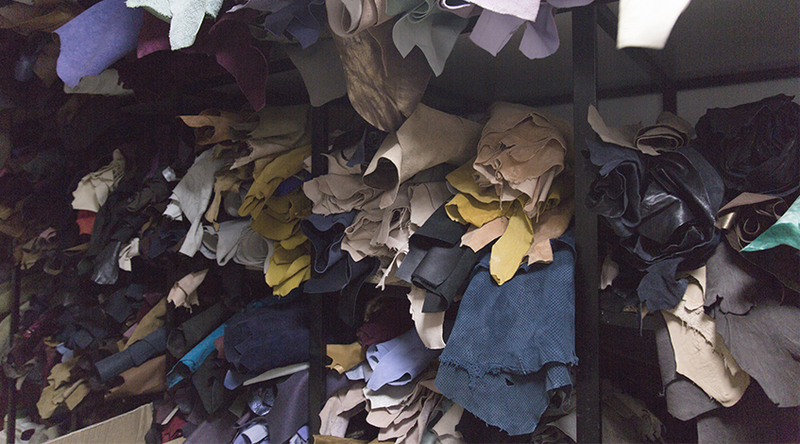 We have our leather dyed in our own colours, we mix the films to create metallic or iridescent effects, we create patinas, work on the sanding and punching of the skins to develop unique items. 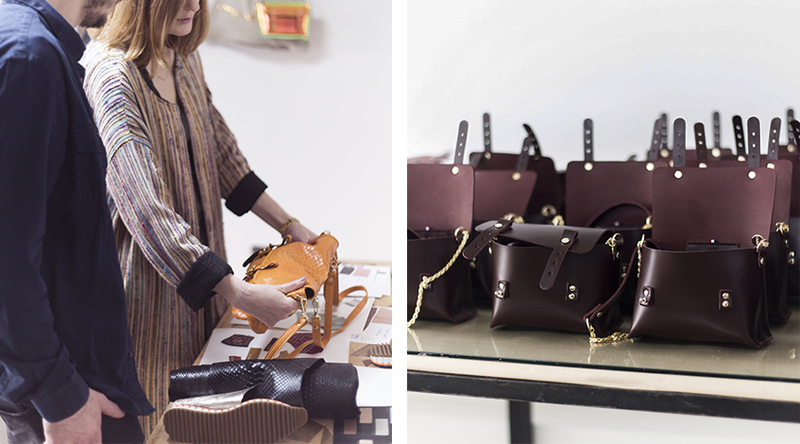 In parallel we create prototypes of handbags, we try to find the right proportions, the perfect finish, we brainstorm over openings and how the bag will be carried. It usually requires 2 to 3 prototypes before we have the final version of the bag. Once all of the different leathers have been received, we mix the skins and the different models to finish the collection. We are perfectionists and we have a lot of ideas so usually our collection keeps changing until the last minute. Creating new collections! Finding inspiration in a recent journey, an art exhibition, looking for colours, forms, when everything finally falls into place, when our models are out of our workshop, when the collection that used to be in our head takes form in our hands. Who is the Craie woman? She has a casual style, she loves fashion and French designers. She lives in the city but loves to relax in nature. She has a good eye for details. She is a dreamer, an artist, a lover. She knows how powerful a beautiful handbag or a pair of shoes can be and how it can change an outfit completely. what's your dream for craie? We’re dreaming about opening a Craie boutique (or several!). To finally have a real place to present our products. We want to build new offices in Toulouse so we can expand our team. We also have a few home décor ideas linked to leather: mixing raw materials such as wood and metal with the softest leathers. But our ultimate dream would be to have more time…more time to focus on these dreams to make them happen, more time for our collections, more time to work on our website and offer a better customer experience for instance. We have many projects! what do you love most about Smallable? Smallable has become a real reference, a global concept that sticks to the desires and needs of urban families. Since we’re coming from the children’s sector, we’ve known Smallable for almost 10 years now. I love how the website is evolving, reinventing itself, how it opened to women’s fashion, home décor and furniture. Not only online but with a beautiful boutique in Paris, which has come in handy for us! I remember that 4 days before giving us we ran rue du Cherche-Midi in complete panic to find a pushchair and a few garments for our daughter, we found exactly what we were looking for without having to wait for delivery! At the park with our daughter Bianca, on a beach in Morocco, in a Parisian restaurant, at the market in Biarritz or on a plane.